I still remember well when Firefox was in its initial versions. It was a very fast browser, beautiful and full of interesting features. In the following years (2005-2007), Mozilla updated its product with minor updates over the months and making a major change yearly. The monthly updates generally contained changes for safety improvements, bug fixes and changes in resources - which were designed to make the software compatible with the latest web standards. Generally, these updates were given a number like 2.0.0.20 - indicating that it was not a major update. 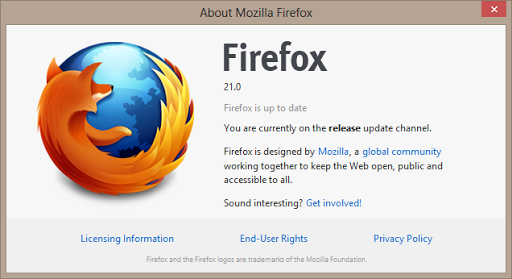 The change in UI and new great features (like Personas, Panorama mode and others) introduced a new major version of Firefox. The annual updates usually aggregated with significant numbers for the product version. Firefox 3.0, 3.6 and 4.0 were some browsers that epoch with its revolutionary functions. The game began to change in September 2008. This was the month that Google decided to release their browser to the public calling it Google Chrome. In just five years, the developer team has released many versions and today offers Chrome 27 in stable channel. At that time, the application won a number of resources and became a real central interactive apps. No wonder it has won many fans. On one hand this tactic worked for Google Chrome, on the other it ruined the business model for the Mozilla browser. Not the case to say that X is better or worse than Y, but what really should be made clear here is that Google knew how to win over the audience, and it might have nothing to do with speed or application resources. The truth is that people are easily impressed by numbers and prefer to be guided by this factor that often does not mean anything at all - especially when it comes to software of different brands. Basically, it is illogical to compare Firefox 21 with Google Chrome 23, but our brain loves to think about the version number. Almost every month is the same litany: "Google releases Chrome 392", "Mozilla Launches Firefox 267". We, the bloggers and editors all over the technology world, just testing and bringing information to the most important news. However, to be honest, for a long time we did not test a browser that deserves praise for major changes in the look or functionality. The advertisements always revolve around "faster than ever", "incredibly light", "compatible with more than 750,000 extensions" and "safer than the safest vault". The developers know that people want all these features and that is why they do highlight these features that often can not be tested. In most browsers we tested, the information provided by the developers are not false. However, with a simple bug fix, the company has announced that it is already faster than the predecessor. In theory, this is the truth, but in practice, a difference of milliseconds represents nothing for regular users. Result? Mozilla has followed the model of Google and, in just two years, managed to jump from Firefox 4 to 21. This helped introduce a number of features, but also led the developer to take hasty actions. As tipped by one of the Firefox Extension Guru, the "Panorama" feature may be removed very soon from Firefox browser. I should point out here that understand well the positioning of Mozilla. After all, perhaps, if they had not taken any action, Google Chrome would have bitten off a portion of the much larger market. At bottom, this never-ending race by improvements ends up being very positive for users - although it is not necessary to change the versions so abruptly. Furthermore, the aggressive tactics of Google helped developers to speed development, delivering much faster results. Who knows if Firefox kept in pace as before, we would not have a product as stable and robust as one software could provide a fully molded according to the standards developer. It is important to note that this race segment did not imply a change for all software. The Opera and Internet Explorer, for example, continued in its rhythms, changing their versions only when there are big news to display. Although hated by many, IE is presented more changes with the arrival of new versions. The tactic to boost downloads of browsers is not widely used by other developers. Apparently, people do not seem to care much if the music player is in version X or Y. At most, users just update iTunes on a recommendation from Apple . Note that you also will not see this useless version bump in file compressors, image editors and other programs. Basically, we can conclude that the updates of browsers only serve to attract new users, because they rarely have large jumps in UI or functionality. What do you think about it?